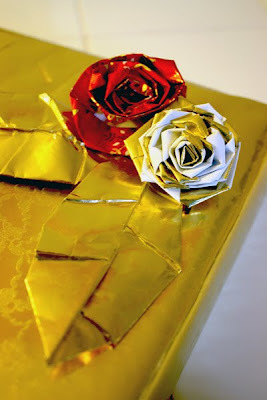 Gonna show you how to make these, because there's still enough time before Valentine's day, and also Heather from Dollar Store Crafts is having a link party and all you need to make these is crepe paper streamers that the Dollar Store sells in packs of two. No glue, no tape, none of that nonsense, just crepe paper and opposable thumbs. When I was about ten years old, we had our village's first summer festival, where one girl from the local primary school got to be the carnival queen. I didn't go up to audition for the role, because I'm kind of phobic of that sort of thing, in fact there were only a handful of girls in our school that were the right age to apply. My classmate Nyree won the job and her family set about preparing costumes and decorations for the event. She was going to be driven down the highstreet on the bonnet of a car in a hunormous dress. We decorated the car ALL OVER with roses that all the girls spent hours twisting out of lengths of white and pink bog roll! Fantastic! I wish I had a photo to show you! 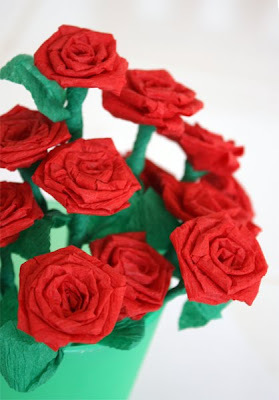 I thought it would be cool to try and make those roses again, but this time with dollar store crepe paper, so that I could also do stems and leaves and hopefully manage the whole thing without any need for glue or fiddling about cutting shapes like most paper flowers require. At the Dollar Tree by us, you can get two rolls of crepe paper streamers in a bag for, you guessed it, a dollar. I picked up red, white, pink, yellow and green. Those seemed like rose kinda colours. Here are some pics of the roses that I made. Just for Heather, here's a pic of some in a Dollar Store salt shaker ;) They really are quite teeny. 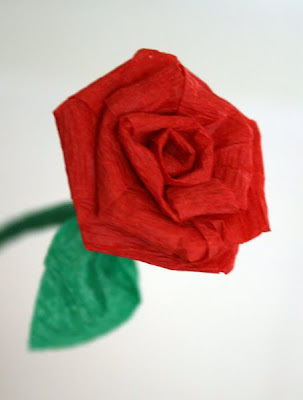 I wonder if you can get wider crepe paper streamers from anywhere to make full size roses. Also, they are a really good way of recycling torn up wrapping paper. 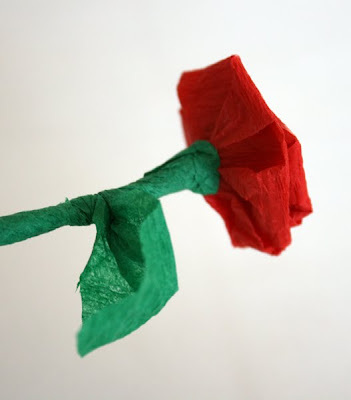 A ripped strip of wrapping paper can be twisted into a rose really quickly and used to decorate another gift. These are lovely! My girls will be thrilled to make these. I think I even have some crepe paper on hand. your kids are adorable, i've very much enjoyed your tutorial! useful info and lovely chatter. your elder daughter is so so funny :) tnx fot the tutorial! 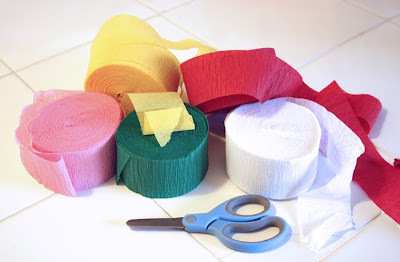 Mum used to make these when we were little - except we never even thought of those rolled streamers. When she was here two summers ago, she wanted to make some for the kids and we had to buy (gasp) Martha Stewart designer crepe paper because that's all they had in the craft stores. Now I know better. Must go show her this post - brilliant! And I love how lovely the roses turned out! Thank you for sharing and getting me all nostalgic! So adorable, the kids and the roses. I love your site! So many good ideas. Keep up the great messy art, I need as many ideas as I can! The video is cute! Thanks for the tutorial. Wow, these are super cute! I actually ran and got the crepe paper from my closet so I could follow along in the video. The instructions were great, unfortunately my folding technique obviously needs some word. Yikes...my daughter sat by my side watching me attempt them and just kept saying "Mommy, your flower doesn't look right." Oh well...practice makes perfect, right? Thanks for the great tutorial. I simply love all of your ideas! Those look so great! I can't believe you do them without any tape or glue... it's almost too good to be true! Thanks for linking up to dollar store crafts, too! I'm going to link to this for tomorrow's DSC post. I love your video tutorial, your 5yo daughter sounds a lot like my 5yo niece, who also sadly lives far away in California. Your roses are delightful, I need to pick up some green crepe paper to make some for Emma's fourth birthday party next weekend. Thanks for the tutorial, I'd never seen anything like that before. These are so fun! I just tried making one with toilet paper. The rose looks but the stem needs a little work. I wonder if tp still comes in pastel colors?? Those are so cute! And I love your little helper in the video too! So cute! I can't get the vid to play either--maybe a problem with your host? Never mind--third time was a charm!! It played fine. Thanks ! I had not thought about using the crepe paper streamers to make flowers. I had tried to find the sheets of crepe paper and it seems impossible to find in local stores. Crepe paper online is expensiveand then there is postage. Now I can afford to make these...I love my Dollar stores. What a cute idea! I made some of them for my wife, and she loved them. However, I couldn't get them to spread out properly so they all looked like tightly-wound, unopened tulips more than roses. I guess I couldn't see how the folding-back would get the points to stick out properly. Or it's just my great fat fingers having difficulty. Anyway, wifey loved them and wants to display them at work. These are so cute and I *love* the video! Hearing other bloggers is the best! Thanks so much for this, I'll be linking. *Whisper* Can I be in the video? *Whisper* You are in the video. Amazing. So entertaining and educational at the same time. I think you should be syndicated! I had to read every single post in your blog. LOVE it! My little one is just 16 months and not quite ready for most of these projects. You will be the inspiration for many afternoons at our house for sure as she gets older. 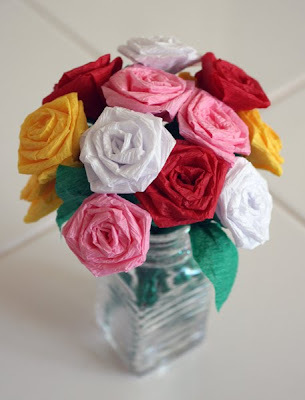 For now, I am going to make some of these roses - totally adorable. I am a new blogger and will be blogging about you today. very pretty photos... i am browsing in the middle of the night so watched the video with the audio off, and i love how the little hands come in so many times to clarify this point or that. Adorable. pretty much explains life with little ones. thanks for sharing. i blogged abt this , so it wont get lost in my overflowing bookmarks ocean..
p.s. to get wider crepe paper ribbon, get a small roll of full size crepepaper and cut the roll at whatever width you want.. instant roll of customwidth crepe ribbon. Your daughter is hilarious! Loved the video. Thank you! This is such an cute idea! I'll be sure to try it soon! Your daughter is so adorable, by the way! This is very helpful. Thanks for the tutorial. hello! i love these so much!!! but when you're making one WITHOUT a stem (i.e. the ones made out of wrapping paper scraps) what do you do with the end of the strip of paper? how would you make one of these out of a straw paper cover? These were awesome and so fun to make! I plan on making them many many times in the future. I also decided to see how it would turn out if I had a longer piece of that same size crepe streamer and made a larger rose.. it turned out very pretty. I did it! I had to watch your video twice but I managed to make a rose! 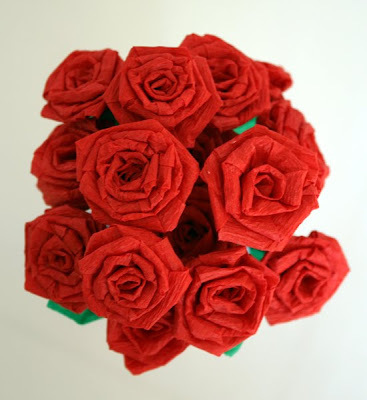 I found your site by searching for "easy crepe paper roses" and YAY it was pretty easy. I thorougly enjoyed listening to your precious children helping in the background. 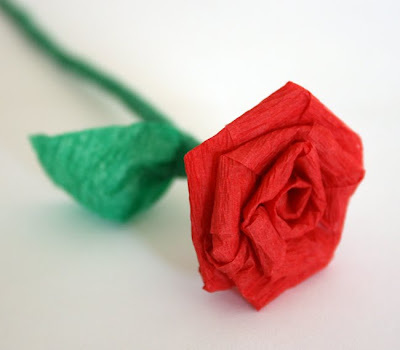 I just posted my version of your beautifully simple roses, with a link to your site. I love this rose tutorial. I linked to the post on my new blog www.makinmesses.com I hope that's ok. Thanks, I was looking for something to impress my girlfriend, you just saved my Valnetine's Day! I am a year out but I was looking for something to entertain my 10year old and 6 year old nieces. My 4yr old daughter might not manage so well and my 2 yr old son will enjoy causing havoc! And I loved the video!! Wo-oW!thank you for this blog,it's wonderful.You helped me,make this work,because i didn't know. Thank you so much! Your post was wonderful and your your little girls are absolutely adorable! Wow! Just brilliant! I loved the video. Is there sound to go with it? It looks very easy to make. I'll have to try these one day. Thanks for sharing. I loved your crepe flower making. It`s so simple but with beautiful results. Lovely video. The presence of the children made the video something very special. I'm sure they seem all grown up comparatively. Love the roses so much! Hi love the roses but I'm having some trouble making them! Anyone else have issues? They are rounded instead of 'folded' not sure what I'm doing wrong! Just dandy and too cute! This was an awesome video, and I LOVE your helper! I was looking for an inexpensive way for some baby shower centerpieces and I found this. I was able to follow along and my first rose (boy blue) looks pretty col. Thank you! I was looking for an inexpensive way to make some baby shower centerpieces and I found this. I love the fact that there is no glue or tape and your helper iss fabulous! I was able to follow along and my first (boy blue) rose came out pretty cool. Thank you! Thanks for sharing. I loved your video and the interaction of having your children help throughout the entire process. Making these to put on paper lanterns for a wedding and your video is very well done. You are an amazing mother. I feel a kindred spirit with you! You daughter/helper was adorable and I felt right at home at mention of the ants. You are so kind and patient with your children; that is the part I have difficulty with myself. Great roses.